My crazy brain thought of this. Using a potato peeler, cut end-to-end, long strips of zucchini, marinate them in salt to extract the water, and toss the strips with a light salad dressing. 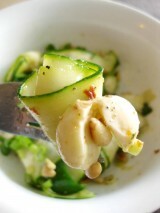 You must use a salad dressing that does not overpower zucchini’s natural sweetness.